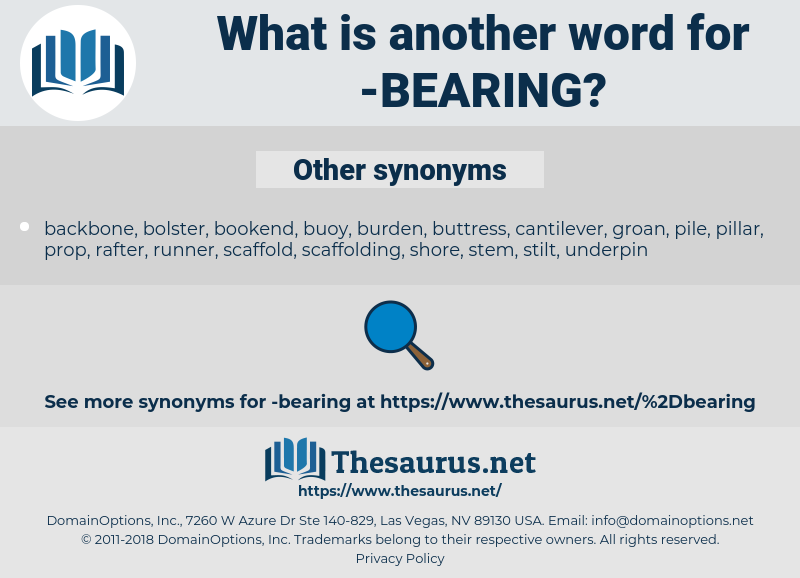 What is another word for bearing? The charges that fill an escutcheon or coat of arms. coordinates, audits, influence, impact, IMPACTS, affect, Affects, incidence, effect, Influencing, relationship, importance, implication, covering, bringing, connection, holding, enabling, meaning, portant, weight. labelled, concerned, Establishing, Brought, included, Issued, covered, involved, Performed, Offered, Entered, marked, conducted, focused, focussed, intended, set. appearing, Incorporating, Reiterating, demonstrating, Acknowledging, Rehabilitating, Adhering, beneath, breathing, Concentrating, Indicating, integrating, reaffirming, Addressing, assuming, remembering, existing, emphasizing, representing, reflecting, Generating, contributing, understanding, Elaborating, asserting, Administering, Originating, Describing, recognising, suffering, Realizing, arguing, accepting, benefiting, Exerting, Arising, encompassing, Shouldering, Proving, Transposing, Guaranteeing, Expressing, realising, Explaining, Contemplating, Withstanding, enduring, gathering, Constituting, exercising, Comprising, Accumulating, Establishing, Exhibiting, operating, Harboring, Charging, evaluating, Experiencing, Embodying, ranging, harbouring, Delivering, regarding, becoming, Introducing, engaging, practicing, Affording, Considering, Entailing, Jeopardizing, Creating, regulating, Proposing, Formulating, Possessing, Afflicting, Declaring, reminding, Alleging, governing, featuring, Stipulating, increasing, Removing, Promulgating, Mentioning, Everything, investigating, pursuing, Relying, accompanying, Sustaining, Defraying, underneath, upbringing, Including, follow, Producing, Excluding, imposing, owing, retaining, travelling, Adopting, Responding, Assessing, Amongst, Presenting, recovering, preserving, combining, Enjoying, Providing, Encountering, rendering, directing, Initiating, Involving, undermining, Applying, grasping, issuing, tackling, Achieving, facing, conserving, fostering, guarding, transmitting, Enacting, Receiving, serving, feeding, Requiring, recording, underlying, performing, proceeding, Plaguing, Consisting, evidence, Depending, conveying, Granting, Restoring, remaining, paying, weighing, promising, Noting, rising, Displaying, Examining, showcasing, Citing, reaching, Embedding, offering, leaving, Discharging, Fulfilling, urging, Committing, Undergoing, Devoting, Employing, dressing, Had, coping, drawing, hindering, Amending, Attaching, completing, determining, impeding, drafting, Counterfeiting, advancing, Forcing, wasting, developing, happening, shaping, Obtaining, leading, ensuring, convening, continuing, Specifying, Mediating, posing, using, contracting, guiding, starting, demanding, Underpinning, lending, dragging, losing, Quoting, Outlining, mandating, opening, Occurring, Submitting, conducting, according, feeling, compromising, Interviewing, yielding, flying, tending, Stating, Disrupting, growing, seeing, Placing, coming, Allowing, balancing, saying, Injecting, deciding, shall, ordering, supplying, Aiming, judging, Extending, Spanning, focusing, detailing, moving, Peaking, returning, Stemming, building, falling, turning, devising, loading, Instituting, Intending, Discussing, sending, playing, figure, resulting, welcoming, surrounding, Owning, reducing, tapping, Needing, fueling, Claiming, calling, footing, knowing, setting, sets, Clutching, Requesting, asking, seeking, Linking, Amounting, keeping, matching, missing, limiting, Hosting, pitting, listing, studying, talking, putting, posting, Gaining, drinking, counting, looking, thinking, finding, letting, ai, sounding, acting, going, controlling, vi, Doing, getting, impact, S, taking, Pertaining, Influencing, covering, bringing, holding, enabling. wears, indicates, relates, covers, provides, programmes, Focuses, deals, Comes. taking, significance, Pertaining, relevance, relation. incompatibility, irrelevancy, meaninglessness, unsuitability, incongruity, variance, pointlessness, incongruousness, extraneousness, uselessness, insignificance, variability, Incongruence. There were many persons bearing similar names. braunschweig, burnoose, behrens, burmanniaceae, barong, brown onion sauce, brunch, brancusi, burnous, burying, brown-nose, brumous, Brawniness, baronage, biramous, burmese-yi, bring, burrawong, branchia, Bering Sea, bronchus, brimming, barrenness, brininess, braincase, brownness, branch, brainwash, brown ash, brown sauce, bromus, beer mug, burhinus, broncho, bronx, burns, bronc, bronzy, bar mask, burnouse, Brown Swiss, burnish, bering, boring, bareness, burmese, barring, bronze, brahminic, brownish, bronco, brunswick, burning, bromic, bronze age, baring, behring, brainish, brewing, baroness, brainiac, borrowing, brink, brahms, bearnaise, brownie mix, browning, boronic, branchy, brown oak, brainsick. 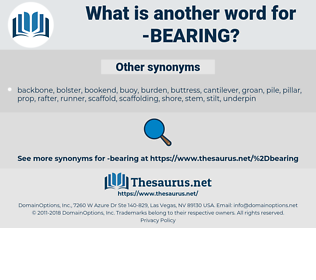 needle bearing, fifth wheel, roller bearing, journal bearing, ball bearing, thrust bearing.